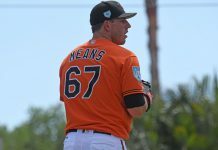 This isn’t an update or a re-ranking, just adding in the prospects the Orioles acquired in the two deadline deals. Luis Ortiz and Jean Carmona from the Schoop trade (Jonathan Villar being the non-prospect piece). Jean Carlos Encarnacion, Brett Cumberland, Bruce Zimmermann, and Evan Phillips from the Gausman trade (the Orioles also received 2.5M in international slot room and cleared O’Day’s contract in the deal). For write-ups on the other prospects, please see my original Midseason Top 50. An important thing to remember about the stocky RHP Ortiz is that he’s been young for his level at every stop. So, while he’s never really dominated a level, he’s consistently performed against older competition. Ortiz offers a mid-90s FB and a plus slider on good days. He hides the ball well and has a deceptively quick arm action. He also has a fringy curveball and a solid average changeup. Oritz has strong command on the inside and outside of the plate and throws a lot of strikes. If he can learn to locate the ball up and down, he should see an increase in K rate. Ortiz has what is considered a bad body and will need to maintain his fitness to avoid the type of nagging non-arm injuries he’s dealt with in the past. That said, he’s a high probability rotation piece with realistic mid-rotation upside. Encarnacion is arguably the headliner of the Gausman deal, although some evaluators prefer Cumberland. JCE is a toolsy 3B prospect, with plus athleticism. He has a chance for 5 average or better tools headlined by a plus power projection. The potential is huge, but he’s very raw from a baseball skills and mechanics perspective. The fact he’s hit well in full season ball despite less than ideal swing mechanics really bodes well for his potential if he can tighten things up. The major issue is his lower half mechanics. He has experimented with different batting stances to try and figure out something that works. Initially he was starting in a closed stance, taking a big step opening up, and letting his hips leak well before the pitch arrives. That was the worst of the bunch. Then he went to a wide-open stance and stepped in, which was much better, but looked uncomfortable for him at times. Finally, since arriving in Delmarva, he’s gone back to starting closed and stepping away from the plate. It’s not nearly as extreme or bad as his early season mechanics, but I do have some concern about the viability of it going forward because it leaves him vulnerable to pitches on the outer half. At 3B he has great quickness, reaction, and a strong throwing arm. He struggles though with his footwork as he gathers himself to throw. This leads to numerous errors and he needs to work to create a more disciplined, consistent transition between fielding and throwing. Carmona is very young (18), if he was a draft eligible player, he’d just be debuting after getting selected out of high school. The tools are there to be an athletic SS or 3B with some pop. Carmona is a switch hitter with a wide, balanced stance and offers plus bat speed produced by quick hands. There are some things he’ll have to improve as he develops. He hasn’t figured out how to use his lower half effectively in his swing yet. He also lets his hand drift up in the load portion adding unnecessary length to the swing. If he can iron these issues out, he could be an above average bat at SS or an average bat at 3B. I haven’t seen enough glove work to confidently project his defense, but reports say that he has a decent shot to stick at SS and if he fills out too much for the position, he has the arm for 3B. Cumberland’s defense has improved to the point that he looks like a guy who could stick behind the plate for most of his controllable years. He’s an adequate receiver and he uses a quick transfer and release to hide a sub-par arm for a catcher. At the plate, he is a patient, late-count hitter. He’ll take plenty of walks and his low hand position and flyball oriented swing should allow him to get to most of his average to above average raw power in games. His swing is mechanically sound, but violent and my concern will be whether he can make enough contact against advanced pitching. The patience/pop combination plays well enough at catcher to rank him here as a good offensive-minded backup catcher with a chance to be a regular. Zimmermann mixes a below average fastball with an average slider, an above average changeup, and a fringy curveball that he uses sparingly (often the 3rd time through the order). He has a great mound presence and knows how he wants to work hitters. He uses his slider and change often, pitching backwards at times and throwing any pitch in any count. He can throw all his pitches for strikes. The fastball is straight and only sits 89-91. In his AA outings, hitters have started to barrel it even when located. He’s going to have to re-calibrate where he can safely throw the pitch. He adds a little deception with a slow motion drop and drive delivery. I think he has a solid floor of a LOOGY if the fastball can’t hold up in the rotation. I’ve seen reports the velocity was up a bit and if he can sit firmly in the 90s he’s probably a 5th starter. Low variance 4th piece of the Gausman deal, Phillips is MLB ready but lacks the offspeed pitch to be an impact reliever. He has a fastball heavy pitch mix with a slider and changeup. It makes sense for him to use the fastball because it’s his best pitch, sitting 94-96, t97 with late armside run. While he doesn’t consistently hit his spots, he does have feel for locating the fastball to all four quadrants. The slider and changeup lack any consistency and they are often noncompetitive pitches. They flash at times and maybe there is some upside there, but I wouldn’t count on it. He has deceptive glove arm action that allows the fastball to play even with hitters sitting on it, although I doubt it’ll have the same success against MLB hitters. He struggled in his initial stint with the O’s, as he looked like he was pressing and struggled to throw strikes, but I think he ends up having some value as a middle reliever.